The image of hundreds, perhaps thousands of toiling slaves, whipped by overseers, seems seared into the modern consciousness, and "everyone" is convinced that the despots who ruled Egypt with iron greedy fists must have built their wealth and glory on the bleeding backs of this tortured labor. 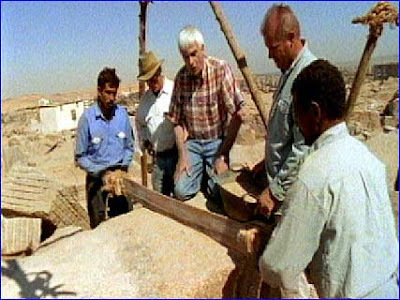 Because currency did not exist in ancient Egypt the workmen were paid in kind. The chief payment consisted of monthly rations of emmer wheat, for flour, and barley, for making beer. The foremen and scribes received a higher salary than the ordinary workmen. Apart from the grain, the workers were given fish, vegetables and water, wood for fuel and pottery. There were also more irregular deliveries of dates, cakes and ready-made beer. Bonuses were issued on festival days or other special reasons. These bonuses might include extra provisions of normal supplies but also sesame oil, blocks of salt and natron, and meat. The workers supplemented their government income by making their own funerary equipment, including coffins, boxes and other items. 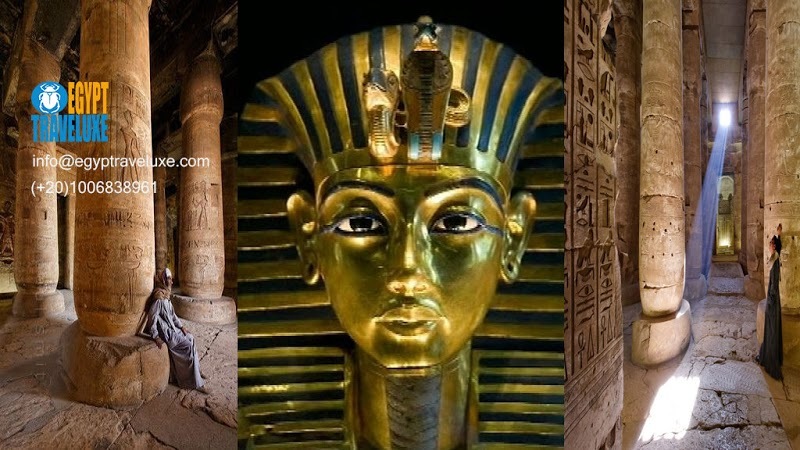 Several popular stories were also found at Deir el-Medina. One of the best known is the tale of Sinuhe, the political refugee in Palestine during the reign of Senusret I. Other tales include the allegorical tale Blinding of Truth by Falsehood, of which only one incomplete copy from Deir el-Medina survives, and still others concern the activities of the gods, such as the adventures of Set and Anat, and a complete papyrus of the Contendings of Horus and Set. If a man sees himself in a dream, looking out of a window, good, it means the hearing of his cry by his god. 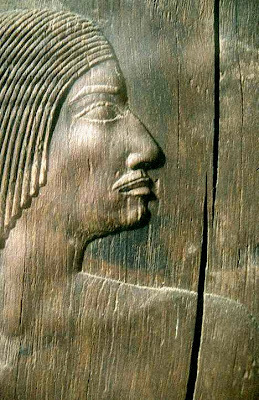 On the back of the dream book, Kenherkhepeshef, copied out in his own hand parts of the victory hymn of Rameses II about the battle of Qadesh, and he also recorded one of his reports to the vizier on the progress of work on the royal tomb. During the reign of Ramesses III The administrators were also corrupt, reducing the grain rations intolerably. A letter sent by the scribe Neferhotep around Ramesses' 25th regnal year states, "On and a half khar of gran (about 168 lbs) have been taken from us.we are dying, we cannot live"
The community seemed to enjoy a good court case,Each man or woman conducted his or her own case, so lawyers fees were not required. in the 17th year of the reign of Ramesses III, and was an attempt by workman Menna to recover payment owed him for a pot of fat he had sold on credit. He was not at all deterred by the fact that the defaulter was the chief of police, Mentmose! Mentmose had promised to pay for the pot with barley, but when he defaulted, Menna reported him three times before the scribe of the Tomb, and finally in the third year, second month, of Ramesses IV, eighteen years later, Menna reported him once more. Mentmose swore to pay before the next month or receive 100 blows of a stick and perhaps pay double. Menna also apparently sued Mentmose over the course of eleven years at another time over non-payment of some articles of clothing. In year 28 of the reign of Ramesses III, Menna also sued the water-carrier Tcha for selling him a defective donkey. The court also dealt with theft. In year 6 of the reign of Seti II, c 1197 BCE, the workman Nebnufer son of Nakhy appeared before the court and accused the lady Heria of stealing a valuable tool which he had buried in his house. The court then asked the lady Heria if she had stolen the tool and she said no. She was then asked if she could and would swear by the Lord about the tool that she did not steal it. Heria immediately took the oath in the name of the god Amun. However, that all seemed insufficient. The court sent a workman to search her house. He discovered not only the tool but ritual equipment stolen from the local temple. Lady Heria was thus found guilty not only of theft, but of blasphemy and perjury as well. She was declared worthy of death, and remitted to the vizier for final judgment. Unfortunately there is no final record of her actual fate. Paneb and Hay were rivals, and Paneb had even been reported to have threatened to kill Hay, just as he had threatened his adopted fatherThey were then each sentenced to receive a hundred blows each for bearing false witness.